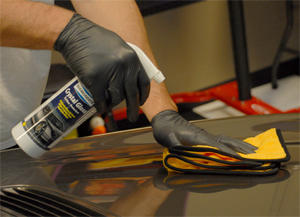 Use Diamondite Crystal Gloss Surface Protectant to protect paintwork from bug adhesion. Easiest product to use to ehance your finish and does a fantastic job. This just might be my new favorite QD. Goes on really nice, no streaking at all. Polishes to a very glossy slick finish and has a nice grape scent. I hope they sell this stuff in gallons soon! This products does what it says-It shines up surfaces that have been cleaned with a product that might remove an existing wax/sealant. Smells grape (nice) no streaks and surface was super slick and glossy. Minimal effort and a little goes a long way.